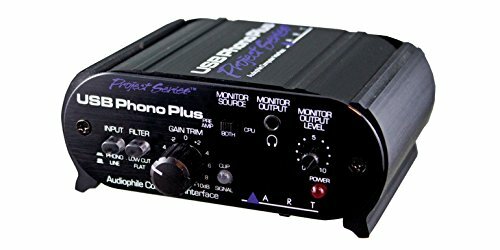 The ART USB Phono Plus phono preamplifier / audio interface is an ideal solution for getting your precious vinyl into your computer. It also does double-duty as an audio interface. You get a high-performance phono preamp with a low cut filter plus a handy selection of of analog and digital I/O. A front-mounted gain knob and a signal/clipping LED let you adjust settings for a broad range of analog sources. This great little device is housed in a rugged, all-aluminum case. If you've got records to digitize, the ART USB Phono Plus is for you.